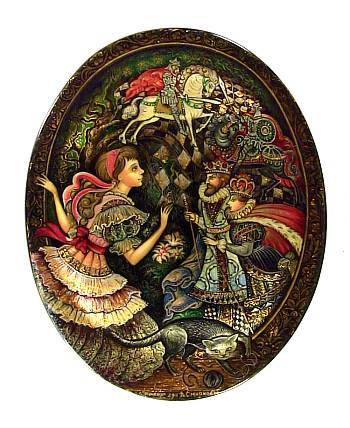 Alice stands just outside the mirror, looks in, and discovers the fantasy universe within. The world resembles a chess board, its people representing different pieces in the game. 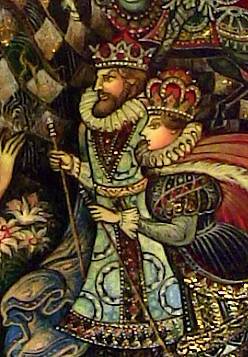 In the foreground you see a white king and black queen, while in the background there is a clash between knights of opposing colors. The box is quite small, but is full of a great number of details, all beautifully drawn. Though not large in relation to other objects, the flowing chessboard itself catches one's eye and helps to seamlessly bind the images together. The work has a nice three dimensional quality to it, as well. The entire lid, slightly convex, functions as the mirror and the vantage point for Alice as she looks inside. 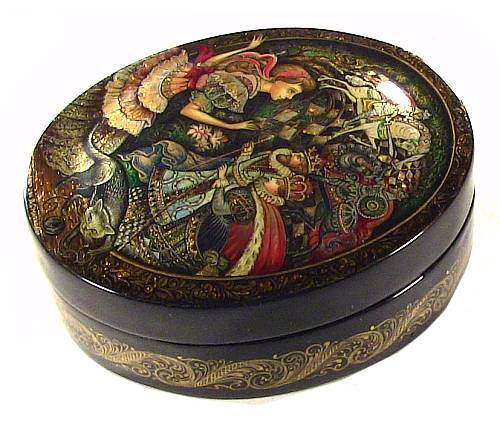 The box is made out of high quality papier mache and has a lovely gold ornament that winds around the sides. The bottom, which has another small gold design, likes flat. THere is a small hinge at the upper left hand corner. SIgned with the name of the artist, village and year. A great miniature from this top Palekh artist!